NQDC plans provide employers powerful leverage for recruiting, retaining, and rewarding the key talent that enables the organization to achieve its goals, maintain stability, and satisfy board members and stakeholders. 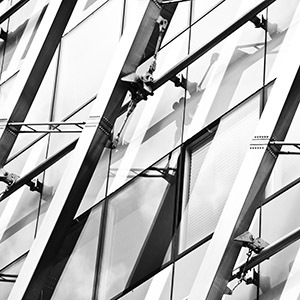 Using NQDC, companies can create phantom shares and provide an ownership experience or create opportunities for key executives to be potential future owners. A nonqualified deferred compensation plan can afford you freedom to enjoy your earnings and/or pay taxes on those earnings at the time that is most beneficial for you and your family. Executives can choose to take payouts to correlate with personal goals such as buying a vacation home or paying for a child’s college tuition. Typically, income taxes are not paid until the tax year the money is actually received, however, you should always consult your own tax, legal, and accounting advisors. Contact Fulcrum Partners. Find out how a NQDC plan could enhance your financial future. As a highly compensated executive, you’re acutely aware that there’s a gap between the combined amount of your social security benefits and your qualified retirement benefits versus the amount of savings you will need to replace your current income. 40% of key executives identify that they are concerned about the gap between their current income and their projected retirement income. Qualified retirement plans, IRAs, and 403(b) plans have limits on contribution amounts. 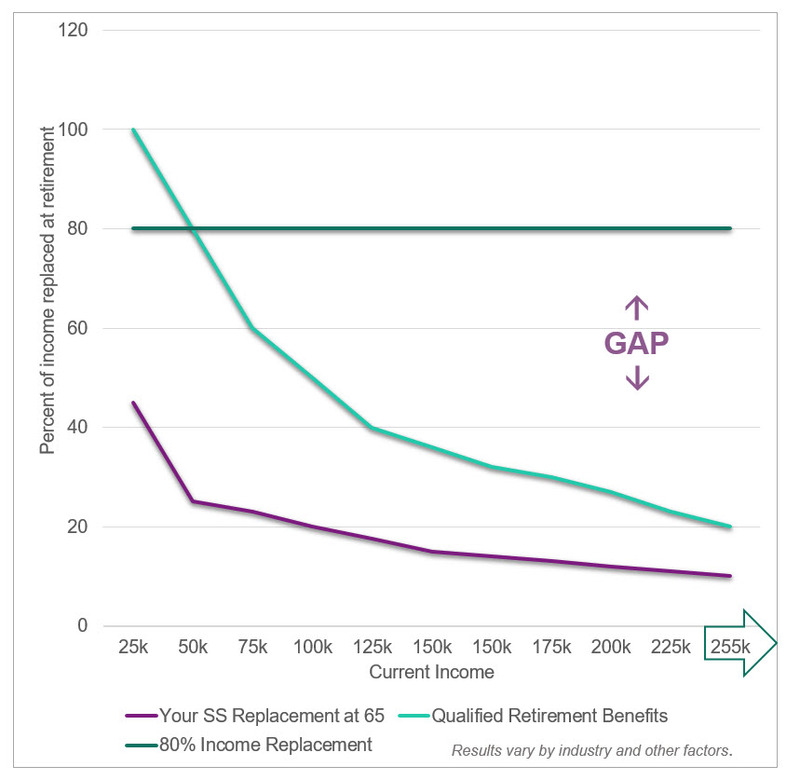 Let Fulcrum Partners show you how deferred compensation plans can provide you meaningful options and opportunities, including 401(k) “restoration” to bridge the replacement income gap. 409A Nonqualified Deferred Compensation Plans: What is IRC Section 409A? Well-balanced risk and reward. You recognize this combination as a cornerstone in an effective compensation program. While organizations have traditionally used (and sometimes overused) stock-based incentives to motivate and retain valued executives, the ever-changing economy has brought to light flaws inherent in many equity programs. Stock price alone does not always correlate with either executive performance or sustainable long-term shareholder value. And executives may have taken excessive risks, contrary to the long-term fiscal interests of the company. A supplemental executive retirement program, (SERP) can help promote a more diversified, portfolio-style approach to executive rewards. Find out how Fulcrum Partners can help you and your organization balance interests and reduce incentive compensation risk. Human capital, key talent, executive leadership … attracting and retaining the best of the best is essential to ensure an organization’s success in any industry or profession. Executive compensation committees, human resources executives, c-suite and other upper management typically focus on current compensation to attract and keep top talent. Yet even those who have the most to lose, may overlook the measurable significance of executive benefits as part of their own total rewards. Fulcrum Partners offers analytics for measuring benefits and benefit outcomes as an integrated part of retirement income, comparing total compensation for peer groups, analyzing retirement contributions, and providing insights on all executive benefits and perquisites. The public data is out there. In most cases, it’s in proxy statements, plan document filings, and annual reports. As an executive, you don’t have to guess how your benefit plan compares with the plans of your peers. Nor should compensation committees or board members have any doubts about how the organization’s plans equate in the short- and long-term to those of competitive companies or how retirement contributions fit into total rewards. 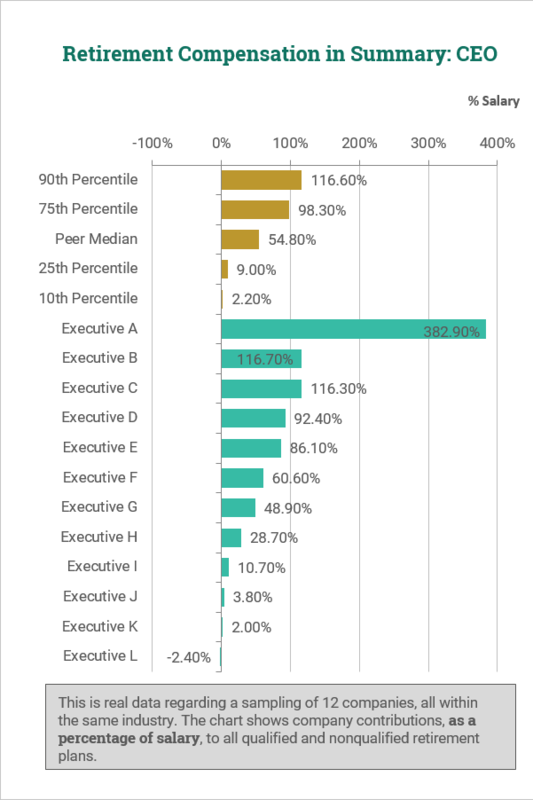 Let Fulcrum Partners show you how executive compensation at your organization compares with that of others in your peer group. 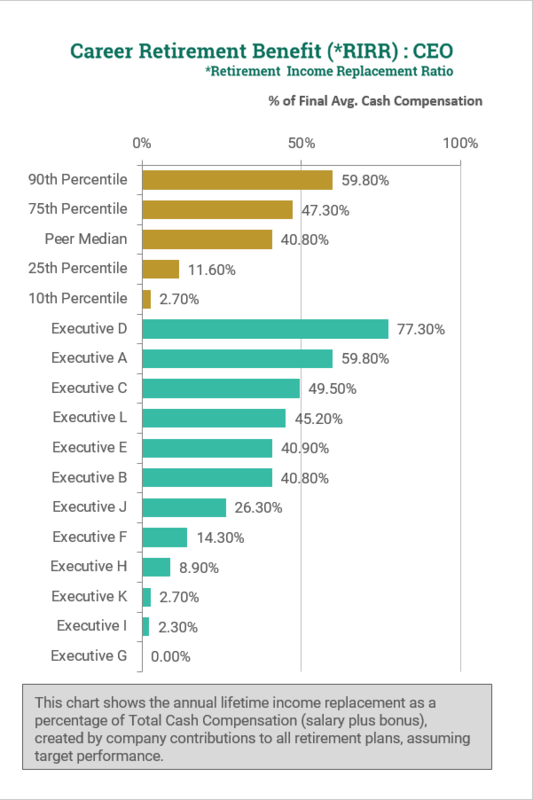 For executives at smaller or privately-held companies, where peer group data may not be as readily available, benchmarking benefits against best practices is an effective and enlightening strategy. Companies have a Statement of Investment Policy for a 401(k) plan. Why wouldn’t they likewise commit to a Statement of Retirement Strategy? What are your benefits relative to those of your peers? What is the Retirement Income Replacement Ratio (RIRR) for the Named Executive Officers (NEOs); the top five highest paid employees in your company) and the core executive population? What should the RIRR be at your company? In other words, what is your retirement strategy within total rewards? The executive benefit consultants at Fulcrum Partners can help you and your organization answer these questions and confidently know exactly how your plans compare with those of your peer group competitors. This chart shows real data for a sampling of twelve companies, all within the same industry. 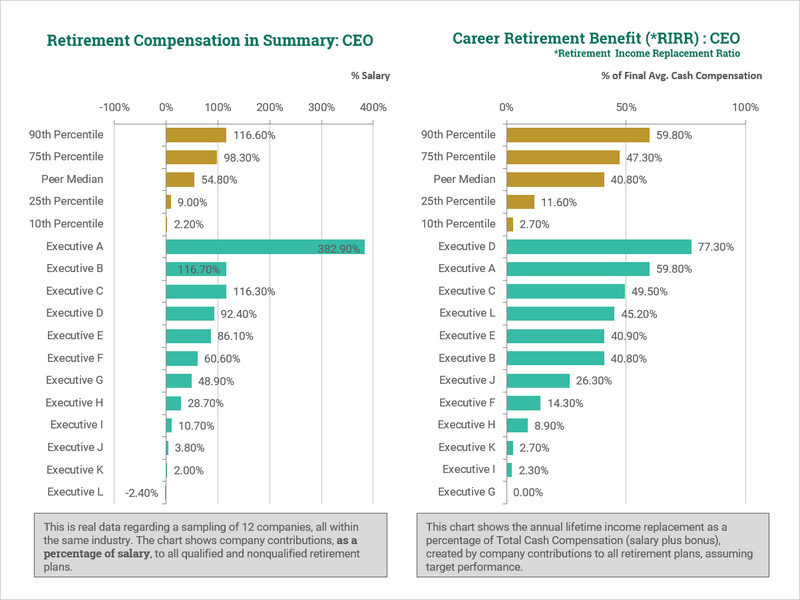 Company contributions appear as a percentage of the CEO’s salary, to all qualified and nonqualified retirement plans. As you see, six companies appear to have incorporated retirement into total rewards and six companies appear to offer only a 401(k) match or a 409(A) match or restoration. This chart shows the annual lifetime income replacement, as a percentage of Total Cash Compensation (salary plus bonus), created by company contributions to all retirement plans, assuming the company meets target performance. RIRR is based on current plan design, age, and year of service. It is a life annuity expressed as a percentage of total cash compensation projected at age 65. Bank owned life insurance (BOLI) has become a predominant tool for offsetting the rising costs of employee benefits. In conjunction with our carrier partners, Fulcrum Partners offers a variety of products designed to meet bank needs while also offering competitive yields. Ask Fulcrum Partners to analyze your needs and develop a portfolio that suits your bank’s investment philosophy, positions you to earn competitive yields, and fulfills regulatory compliance and documentation requirements. Bank owned life insurance (BOLI) has become a best practice to informally fund officer and director nonqualified benefit expenses and other employee benefit liabilities. Many of the nation’s largest banks, as well as thousands of community banks, have implemented BOLI strategies. These plans provide tax-advantaged income not available with traditional bank investments. Corporate Owned Life Insurance (COLI) is an institutional life insurance product your corporation may purchase to cover a select management group. The purpose of the purchase includes the financing of executive benefit plans and other corporate liabilities. COLI offers income tax advantages that make it highly attractive for most companies. Fulcrum Partners is recognized as one of the largest, independent distributors of Corporate Owned Life Insurance in the US. * Assumes a 40% effective tax rate on taxable investment. 1 The rates of return are for illustrative and analytical purposes only and the results are not guaranteed. Results may vary based on actual investment performance. You should always consult your own tax, legal, and accounting advisors. The investments available to an insurance company to optimize its risk/return profile while improving earnings, surplus, and financial strength, are limited. Insurance company owned life insurance, (ICOLI) is one of the few options available to an insurance company to enhance its tax adjusted earnings, gain favorable risk based capital (RBC), and expand investment choices available to insurers. Similar to BOLI, ICOLI includes all life insurance that an insurance carrier purchases and either owns or in which it has a beneficial interest. *Held for trading “short term” vs. held for long term. Contact Fulcrum Partners and let us help your organization explore the value of using tax-advantaged benefit financing strategies. *The rates of return are for illustrative and analytical purposes only and the results are not guaranteed. Results may vary based on actual investment performance. You should consult your own tax, legal, and accounting advisors. Protect your assets with business succession plans, buy/sell agreements, key person insurance, disability insurance, and executive life coverage. Change can occur slowly or abruptly. What happens when the key decisionmaker at a privately-held or family-owned business steps down … or for any number of reasons, is no longer at the helm? The best time to put a succession plan in place is before you need one. Buy/sell agreements can ensure the continuity of a company after the death of its owner. Heirs are guaranteed a buyer for the asset while business owners gain peace-of-mind that their business will wind up in the right hands. 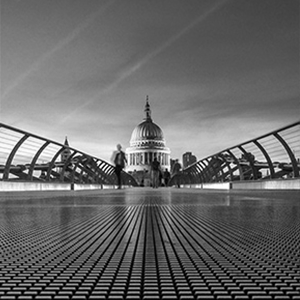 For bespoke solutions for even the most complex business planning needs, contact Fulcrum Partners. Much of life comes down to time and money. With this in mind, you or your company may find executive life and executive disability benefits and similar insurance strategies essential for dealing with life’s unpredictability. 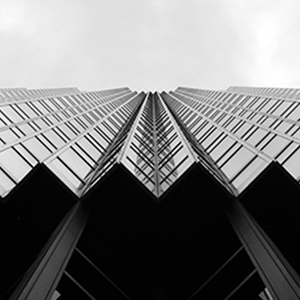 The death of a key executive can trigger immediate vesting and disbursement of pay elements, including stocks, severance, and deferred compensation. Is your company prepared to weather this level of strain and cash-flow disruption? In the routine course of business, atypical events may create the need for short-term life or disability coverage. Perhaps key executives are traveling together or mergers and acquisition negotiation and closing periods or pre-initial public offering (IPO) illiquidity periods result in the need for additional insurance. Generally, these types of policies can be in place quickly, simply, and with limited underwriting requirements. Fulcrum Partners for sound, creative, customized insurance strategies. 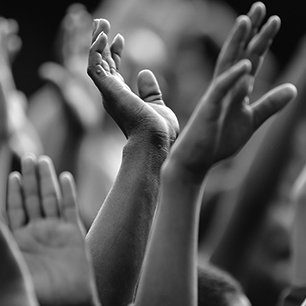 Fulcrum Partners Asks // Who Inspires You? What does it take to change a city? The road has not been easy, yet great accomplishments rarely are. At Kivu Hills Academy, a vocational school in Boneza, Rwanda, the challenge of raising the money to construct the school paled in comparison to the project itself. Today, Phase I of building Kivu Hills Academy is complete. The fact that the work was done largely with hand tools and a labor force that was willing but meager, makes the accomplishment even greater. 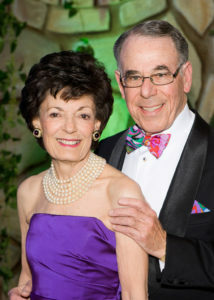 In the city of Houston, Ann and Stephen Kaufman have long been recognized for their leadership and support of beneficial programs that truly change the lives of others. 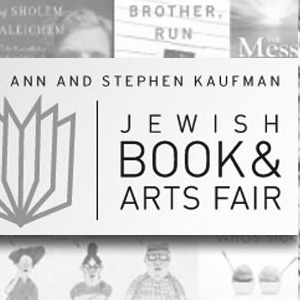 In 2013, they were honored with the renaming of the annual Jewish Book & Arts Fair as “The Ann and Stephen Kaufman Jewish Book and Arts Fair.” Featuring literary and cultural events, this exposition is one of the largest Jewish book fairs in the U.S. Giving to others through their time and talents is what first brought Ann and Stephen together; the couple met while doing volunteer work in the community they love. Over the years, their commitment to the Houston area has earned each of them a litany of impressive awards, but none more meaningful than the knowledge that the book fair that bears their name will bring years of inspiration and new insights to others. Identified by the U.N. as the third-poorest country in the world, West Africa’s Burkina Faso, is landlocked by Ghana, Mali, and the Ivory Coast. Children here grow up in a difficult and challenging environment in which human trafficking is pervasive and access to food, clean water, education, and healthcare is severely compromised. Fulcrum Partners Managing Director, Scott Cahill and his wife Joanie, maintain their commitment to the Luis Palau Association outreach. Through its $25,000 gift, Fulcrum Partners was a Presenting Sponsor of the Love Burkina Faso Festival. Andrew Palau led the festival, which reached beyond churches and into the hearts and souls of the city’s communities and equipped local leadership to deliver solutions for the most compelling needs. For many people, Rwanda represents suffering, strife, genocide, and horrors, yet today, new chapters are being written for Rwanda. Cultures that were once the harshest of enemies are discovering how forgiveness opens doors for progress, growth, and remarkable healing. 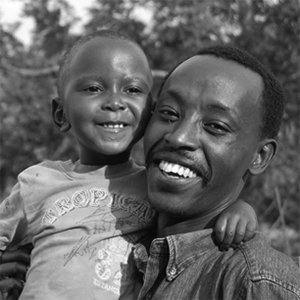 The Valmark Global Gift Fund is helping the people of Rwanda move toward a brighter future in which education is a powerful catalyst of change. 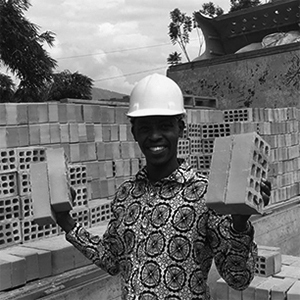 By donating $10,000 to this project, Fulcrum Partners provided ten percent of the total amount needed to commence construction of a vocational school, overseen by the team at Arise Rwanda Ministries (ARM). For children in Rwanda, the opportunity to go to school affords the assurance of a daily bowl of porridge as well as the education needed for a better life. The Luis Palau Association has led a 10+ year initiative to join with Christians throughout Africa in spreading the good news of the Gospel. Thanks to Scott Cahill of Fulcrum Partners, along with other donors, the campaign was carried into Ethiopia. Through 175 events held in Addis Ababa and other cities across the country, more than a quarter million people shared the ministry’s evangelic message of joy and faith. The Luis Palau Association began a mission to transform cities by way of a united and sustainable effort involving churches and cultural leaders. 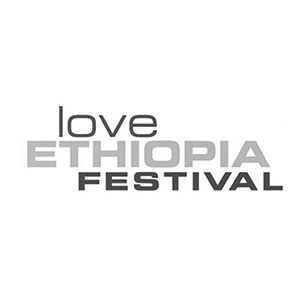 As part of the Luis Palau CityServe project, the Love Ethiopia Festival helped unite local governments and evangelical churches to tear down walls, debunk stereotypes, and attack today’s toughest issues, such as human trafficking, street and gang violence, homelessness, poverty, and health and wellness.